Jan Haughn obituary. Carnes Funeral Home. It is with heavy hearts that we have to say goodbye to our beloved parents, Jack and Jan Haughn. Janice Marie Preston Haughn was born in Monroe, Louisiana in February 1928 to Janice and Kyle Preston. She grew up in Port Arthur and attended Lamar Junior College before transferring to the University of Texas in Austin, where she met Jack Ernest Haughn. Jack was born to Gladys and Ernest Haughn in Fremont, Nebraska, in December 1927. Jan went to heaven in March 2017 and Jack joined her in November 2018. Jan loved to garden, read, play cards, bowl, sew, quilt, and volunteer. Jan earned her dietetic science degree from UT Austin in 1950 and was working on her master’s when she met Jack. She was a beautiful person inside and out. She always had a smile on her face and she made friends wherever she went. When she would interact with anyone, someone at the store, a friend, or a family member, she would always find a compliment to give them. She was known as Dr. Ruth to many friends and family members, willing to give advice on any subject. Throughout her life, she volunteered with the Girl Scouts, the women’s club in Brussels, Ronald McDonald House in Houston, and at MD Anderson’s Cancer Information Services, (CIS), plus many other places. She was such a wonderful volunteer at CIS that they offered her a job, where she worked for 10 years. Jack joined the United States Army Air Forces (USAAF) in 1945 when he was only 17 years old, and had to wait six months to begin basic training. He served in the USAAF for three years and was honorably discharged in 1948. Jack enrolled in Midland College in Fremont for a year, transferred to UT Austin for its petroleum engineering school in 1950, and graduated in 1952. Jack maintained his connection to the military by joining the Air Force Reserves, where he served until 1971 retiring as a Captain. Jack loved planes, trains, history, and photography. His favorite plane was the P-38. Many years ago, daughter Julie arranged for him to take a ride in a P-38; he loved that flight. We have many pictures of him with his camera around his neck, and we have many, many photo albums of their trips around the world. One of Jack’s favorite parts of being in the Air Force was working in the air traffic control (ATC) tower. A week before he joined Jan in heaven, daughter Cindy arranged for him to go to Randolph Air Force Base (RAFB) for a tour of their ATC tower. All four children were there and we had lunch at the Officers’ Club. After lunch, we took the tower elevator as far as it would go and, and at almost 91 years young, Jack was able to climb the final 35 steps for the tour. The look on his face when he got to the top of the steps and walked into the “cab” was unforgettable. The respect and courtesy shown him by the RAFB ATC staff was truly amazing. The tour has given us all a wonderful memory. Jack worked for Exxon Chemical in the Houston area and all over the world for 20 years, before retiring in 1985. During their married life, Jack and Jan lived in Austin, Houston, Richardson, Chicago and Waterloo (Belgium), returning to Houston in 1979, and then finally returning full circle to Austin. They lived on Queensloch in Houston for 50 years. All four kids grew up in that house, and we have wonderful memories of gatherings of friends and family throughout the years. On Memorial Day 2015, their Queensloch home flooded for the first time in 50 years. Jan was in physical rehab at the time, so a family decision was made for Jack and Jan to move to Austin. We asked Mom if she wanted to see the house one more time before they moved to Austin, and she stated that home is where her family was and she did not need to see the house again. Jack and Jan lived an incredible life; they loved to spend time with family and friends and they loved to travel. They traveled all around the United States, Europe, Asia, South America, Australia and the Middle East. They made a point of not staying in the tourist areas. They loved being with the locals, and some of our best memories are from these encounters. Many times, we would be having dinner: eating, drinking, laughing, and having fun. Someone would send us a round of drinks, Dad would reciprocate with a bottle of wine, and before you knew it, we would have 20 people around our table. On at least one occasion, Jan was observed dancing on top of the table. If you do not know the “A-bomb” story, please ask one of the kids! Many times, someone would call up and say, “Let’s take a trip somewhere,” and off they would go. You always felt loved when you visited the Haughn household. You were met at the door with a hug and a kiss; Jan would ask what you would like to eat, and Jack would ask you what you would like to drink. They always had a full bar and refrigerator. Often at 5 o’clock, they would get their chairs and their cocktails and go in front of their house to sit, hold hands, and wave to all who drove by. For those that stopped or happened by, Jack would get you a drink and a chair. Many spontaneous parties happened in their front yard on Queensloch. 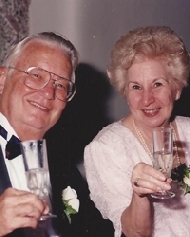 Jack and Jan loved each other, their children, grandchildren, and great-grandchild with all their hearts. They are survived by their four children and their spouses, Kathy and Frank Stautberg of Richmond, Texas; Neil Haughn and Rob Chandler of Austin, Texas; Julie and Bob Woche of Austin, Texas; and Cindy Haughn and Jon Lautenschlager of San Antonio, Texas; by their six grandchildren, Geno and Jessica Stautberg of Pearland, Texas; Eric Stautberg of Houston, Texas; Alex Woche of London, England; Danielle Woche of New York, N.Y.; Jesse Woche of Los Angeles, Calif.; and Jack Woche of Austin, Texas; and by their great-grandchild, William Stautberg, and his soon to be brother. Jan is survived by her brother Kyle Preston and his wife, Diann. Jack is survived by his niece Carol Woods and her husband, Bill Fisher. In a final act of generosity, Jan and Jack chose to donate their bodies to further medical research and training at the UT Health Science Center in Houston. A Celebration of Life will be held in Jack and Jan’s honor on Saturday, January 5, 2019, from 1–5 p.m. at the UT Etter-Harbin Alumni Center in Austin, Texas. Since Jack and Jan loved to celebrate, please feel free to wear your favorite colors. In lieu of flowers, we would ask that you make a donation to Ronald McDonald House Charities Houston (link below) or the charity of your choice.